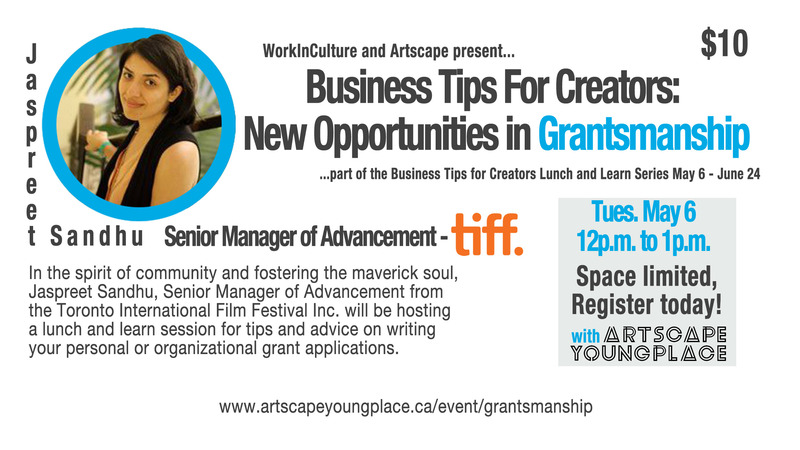 In the spirit of community and fostering the maverick soul, Jaspreet Sandhu, Senior Manager of Advancement from the Toronto International Film Festival Inc. will be hosting a lunch and learn session for tips and advice on writing your personal or organizational grant applications. Ideally, participants will attend with a specific project and/or series of questions to address in the session. Jaspreet will be providing an introduction to the process, structure, tips on writing techniques and general rules for successful grant-writing. This workshop is being held in partnership with Artscape Launchpad, WorkInCulture and the Toronto International Film Festival, with support from the Ontario Trillium Foundation as a part of the Business Skills for Creators and the Business Skills for Growth series. Artscape Launchpad will be a new creative and cultural sector entrepreneurship centre connecting the creative community with the tools, knowledge and space to establish and grow small businesses and commercial projects.